A B M P m e m b e r s e a r n F R E E C E a t w w w. a b m p . c o m / c e b y r e a d i n g M a s s a g e & B o d y w o r k m a g a z i n e 17 MIND OF AN MT Have your own insights or inspiration to share for Mind of an MT? Email editor@abmp.com. 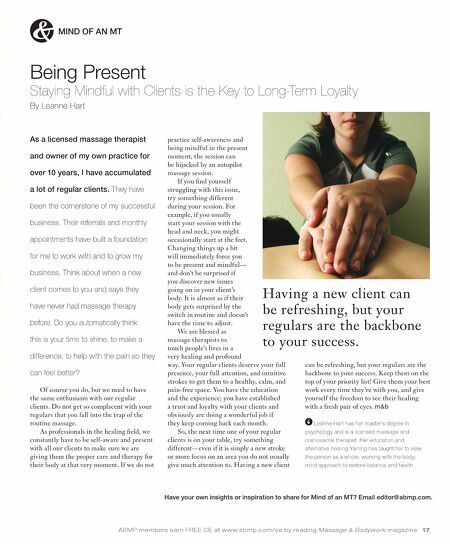 Being Present Staying Mindful with Clients is the Key to Long-Term Loyalty By Leanne Hart As a licensed massage therapist and owner of my own practice for over 10 years, I have accumulated a lot of regular clients. They have been the cornerstone of my successful business. Their referrals and monthly appointments have built a foundation for me to work with and to grow my business. Think about when a new client comes to you and says they have never had massage therapy before. Do you automatically think this is your time to shine, to make a difference, to help with the pain so they can feel better? Of course you do, but we need to have the same enthusiasm with our regular clients. Do not get so complacent with your regulars that you fall into the trap of the routine massage. As professionals in the healing field, we constantly have to be self-aware and present with all our clients to make sure we are giving them the proper care and therapy for their body at that very moment. If we do not practice self-awareness and being mindful in the present moment, the session can be hijacked by an autopilot massage session. If you find yourself struggling with this issue, try something different during your session. For example, if you usually start your session with the head and neck, you might occasionally start at the feet. Changing things up a bit will immediately force you to be present and mindful— and don't be surprised if you discover new issues going on in your client's body. It is almost as if their body gets surprised by the switch in routine and doesn't have the time to adjust. We are blessed as massage therapists to touch people's lives in a very healing and profound way. Your regular clients deserve your full presence, your full attention, and intuitive strokes to get them to a healthy, calm, and pain-free space. You have the education and the experience; you have established a trust and loyalty with your clients and obviously are doing a wonderful job if they keep coming back each month. So, the next time one of your regular clients is on your table, try something different—even if it is simply a new stroke or more focus on an area you do not usually give much attention to. Having a new client can be refreshing, but your regulars are the backbone to your success. Keep them on the top of your priority list! Give them your best work every time they're with you, and give yourself the freedom to see their healing with a fresh pair of eyes. Leanne Hart has her master's degree in psychology and is a licensed massage and craniosacral therapist. 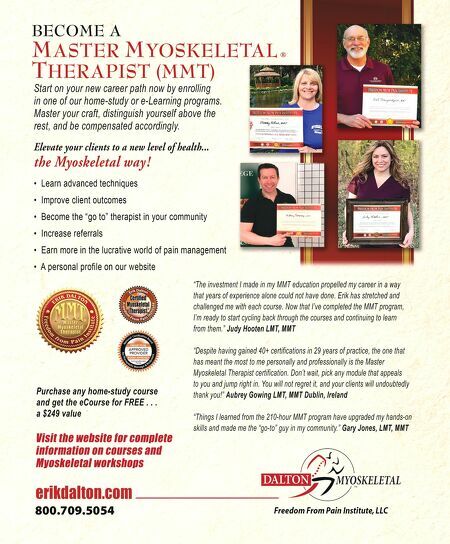 Her education and alternative healing training has taught her to view the person as a whole, working with the body- mind approach to restore balance and health. Having a new client can be refreshing, but your regulars are the backbone to your success.